A been-there, done-that mom getsanother chance to experience the little miracles of babyhood. My eggs,” I informed Dr. Brown with some authority, “are overripe. Pregnancy is simply impossible.” He looked at me strangely, perhaps not recognizing “overripe” as a medical term. He mumbled something about women over 40 having babies all the time and escaped to his next patient. “Have you had a tubal ligation, dear?” the nurse asked gently. “Why, no,” I replied. “Then you’ve been abstaining from sexual activity?” Obviously a woman who doesn’t know my husband. “No,” I admitted. Teenagers. People who think $100 sneakers are high fashion and that Diet Coke is a food group. People who hide their dirty laundry and set their VCRs to catch South Park. Over the past 16 years, I’ve forgotten about diaper rash and prickly heat. But I’ve learned many more important things: that ’N Sync sounds nothing like the Backstreet Boys. That my sons will not answer to “Sweetie” in public. These things I can remember. But can I remember the words to Itsy-Bitsy Spider? Can I still deliver Green Eggs and Ham with the proper amount of gusto? Can I identify Elmo in a lineup? My husband took the news bravely. He disappeared into his La-Z-Boy and did not move or speak for three days. “Maybe because I nursed three children like this,” I said without a trace of sarcasm. Maybe, just maybe, I might possibly know what I’m doing. And maybe, just maybe, I can do it all over again without going crazy. 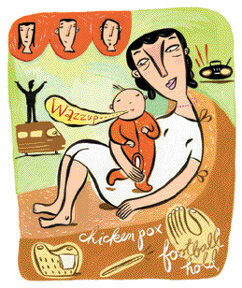 Without panicking over a 101ÞF fever or the kid next door with chicken pox. Maybe this time, I can make more mud pies and do less laundry. Dance and giggle more. Listen harder, lecture less. Maybe this time, I can enjoy it more and worry less. When I went into labor, my kids played loud hip-hop music in the delivery room to keep me entertained. Within a few hours, my newest son be-bopped his way into the world. Giving birth was just like I remembered: We were both a little gooey, a little tired, but pretty content. “Hi there, Handsome,” I whispered. He blinked, then stretched. A gurgle, nice and loud, escaped his tiny mouth.